CCEDNet-Manitoba has, in response to the Manitoba government's invitation for pre-budget submissions, provided recommendations that bring a CED perspective to the 2017/2018 budget. Our submission, which was sent to the Hon. Cameron Friesen, M.L.A., Minister of Finance, includes 10 budget recommendations based on policy resolutions that have been developed, debated and endorsed by the members of CCEDNet-Manitoba. 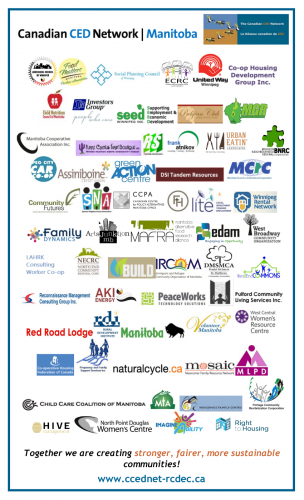 Invest in the recommendations presented in written submissions by the Manitoba Child Care Association, Make Poverty History Manitoba, and the Right to Housing Coalition. Allocate sufficient resources to honour the multi-year funding agreements with organizations in the NPO Strategy. Maintain funding for Neighbourhoods Alive!. Invest significantly increased human and related resources to ensure the timely and effective implementation of The Accessibility for Manitobans Act. Allocate funding for training and wrap-around supports (e.g. housing, addictions treatment, and cultural reclamation) to social enterprises that employ people at high risk of offending or re-offending. Allocate $10M annually for social purchasing from social enterprise through Housing. Invest in staffing to enable other departments (i.e. Infrastructure) to generate the value that Manitoba Housing has achieved through social purchasing. Invest $250,000 to implement Year 3 of the Manitoba Social Enterprise Strategy. Invest $250,000 to implement Year 4 of the Manitoba Co-operative Community Strategic Plan. Maintain the existing NHFI budget and consider increases to scale up existing initiatives, expand into other Northern communities, and achieve new revenues through reductions in health costs and job creation.